The MB Custom Post Type extension is a powerful tool that helps you manage your custom post types and custom taxonomies via a user-friendly interface. It’s very helpful when you want to create or edit a custom post type / custom taxonomy without touching code. After installing and activating the plugin, you’ll see new menu items Meta Box → Post Types and Meta Box → Taxonomies. 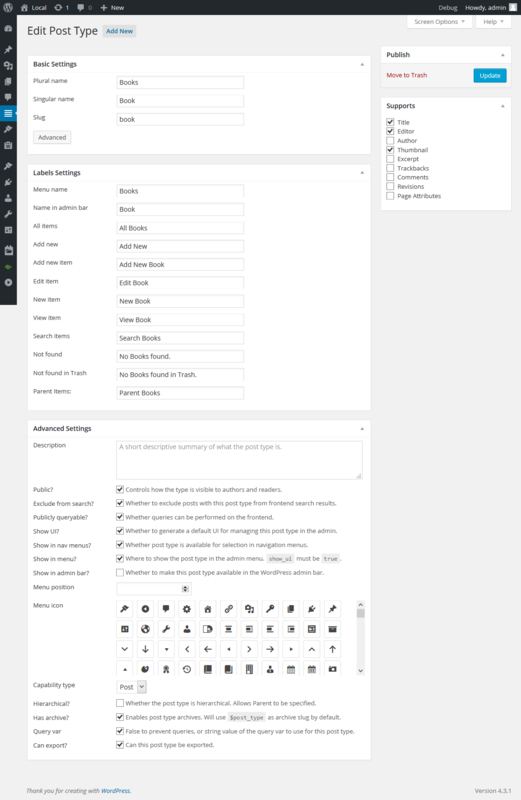 Clicking on each menu will go to the admin page where you can create/edit custom post types and custom taxonomies. When creating custom post types, you have 3 options to set capabilities: copy from “post”, copy from “page” or create custom capabilities. While copying from “post” or “page” is clear (the plugin simply applies the same capabilities from post or page for this custom post type), creating custom capabilities might be confusing. And thanks to map_meta_cap, standard admin role is able to edit the posts types.